Next 17th August, the General Assembly of United Nation is due to approve the UN Declaration on the Rights of Indigenous People (IP), before the conclusion of the 61st GA session. 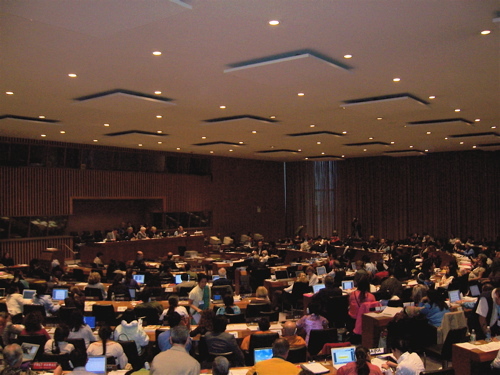 The Human Right Council already adopted the Declaration on the 29th of June, 2006. Although the Declaration is not a binding document it would be a historic step on the recognition of Indigenous Rights, specially regarding self-determination and land ownership. Unfortunately, there are a few countries trying to delay the adoption of the Declaration as there are some contentious issues on the table that could affect the control of the States over territories and the land concessions and patents of trans-national corporations. The countries opposing the Declaration are: US, Canada, Australia, New Zealand, Columbia, Guyana, The Russian Federation, and Suriname (see below document submitted by these countries). Non-surprisingly all these countries have been accused of Human Rights Violations, but still they have the power of influencing the agenda of United Nations, while IP are not allowed to participate in the General Assembly, as they are not State organizations. “In particular, Australia, New Zealand and the United States have been subject of ‘early warning and urgent action’ procedures by the Committee on the Elimination of Racial Discrimination (CERD) regarding their treatment of Indigenous peoples. Other UN bodies and international missions have reported the following. In Colombia, Indigenous peoples have been subjected to murders, forced disappearances, torture, forcible displacements, and sexual violence. Similarly, in Guyana, there have been allegations of extrajudicial killings and torture by the police, and widespread sexual violence including in places of detention, accompanied by an extremely low rate of convictions. In the case of the Russian Federation, there have been numerous, ongoing and consistent allegations of acts of torture and other cruel, inhuman or degrading treatment or punishment committed by law enforcement personnel. In the case of Suriname, state agents allegedly committed crimes against humanity by massacring over 40 women, men and children and razing a tribal village to the ground. Although such crimes were committed in 1986, Suriname failed subsequently to investigate, prosecute and punish those responsible. Please find below the ‘non-paper’ submitted two weeks ago by governments opposed to the adoption of the Declaration on the Rights of Indigenous Peoples and raising ‘thematic concerns’. The ‘non- paper ‘ does not identify which States have which concerns. The parties that have supposedly agreed to this document did not put their names on it. It appears that this ‘non-paper’ was submitted to the representative of the President of the General Assembly by seven governments: Australia, Canada, Colombia, Guyana, New Zealand, the Russian Federation, and Suriname. “The General Assembly agreed to further consultations on the Draft Declaration to give the international community the opportunity to try to adopt a Declaration that all countries could support as a genuine standard of achievement to live up to. The President of the General Assembly has recently appointed the Permanent Representative of the Philippines, H.E. Mr. Hilario G. Davide, Jr., to facilitate an open and inclusive process of consultations to reach the broadest possible agreement on the Declaration, taking into account the views of all parties.In this context, this non-paper is the result of informal and on-going consultations between a significant number of States with indigenous populations, and summarizes their key areas of concern with a view to supporting the objective of reaching agreement within the 61st Session of the General Assembly. These areas of concern are not necessarily shared by all States with concerns about the text. Amendments to the current text of the Draft Declaration will be required in order to secure support for adoption. The current text could be misconstrued so as to threaten the political unity, territorial integrity and stability of States, and confer a right of sucession upon indigenous peoples. Provisions dealing with the need to achieve harmony with other levels of government are insufficiently developed. The text on lands, territories and resources is broad, imprecise, and not capable of being implemented, and asserts rights of ownership to all lands, territories and resources, whether owned currently or previously occupied – wherever there is a traditional connection. For many States, this might encompass all of the lands, territories and resources of the State, including those considered a national common good. The text on redress and restitution is broad, and asserts that States should provide redress for property taken without free, prior and informed consent. The text could be interpreted as promoting the re-opening of settlements already reached between States and indigenous peoples and does not take adequate account of the different situations facing indigenous peoples and States. The text currently includes an unqualified right of free, prior and informed consent for indigenous peoples on all matters that may affect them, which implies that indigenous peoples may exercise a right of veto over all matters of the State including the laws and reasonable administrative measures democratically enacted by the State. There is uncertainty as to the text’s application or non-application with respect to tribal groups, ethnic groups, minority groups, and indigenous peoples. The text could be misconstrued so as to be inconsistent with existing legal obligations and to restrict the ability of the State to protect its population and territory, including efforts for civil defence and emergency preparedness. The text suggests that Indigenous rights prevail over the rights of others, without sufficiently taking into account the rights of other individuals and groups, and the welfare of society as a whole. In stating that indigenous peoples have a right to maintain, control, protect and develop their cultural heritage, cultural expressions and traditional knowledge, as well as rights to human and genetic resources, the text goes well beyond current and evolving intellectual property rights regimes and could undermine complex negotiations in other fora. Entry filed under: Indigenous Resistance, Rights, and Survival. The nations that are the most opposed to this are showing to the rest of the world the true depth in which they have par-taken in the abuse and utter guilt that they realize is on there heads. Just as a person can ask forgiveness and make amends, so should they.